When I play basketball, I have to come to terms with the fact that I am not a tall person (5-foot-7 is average, not short, thank-you-very-much). If you direct your attention to the photo on the right (the one in the gray shirt is, sadly, me a few years ago), you will clearly see that I had no future as a center or forward. 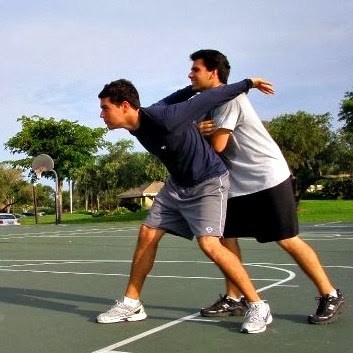 You will never see me posterizing a defender Blake Griffin-style. And that’s OK. Complaining about my height will not help me grow five inches taller overnight. If I insist on playing the center position myself, I am only hurting my team because there's no way I can cover someone who is a foot taller than me. It’s selfish and it’s stupid. So, instead, I had to accept playing a position that best suited my skill set -- the guard position. I focused on my passing, my shooting range and ability, and my perimeter defense. Instead of dwelling on my weaknesses, I focused on my strengths and what I can offer. Just because I’m not tall doesn't mean I can’t be effective or make an impact. Are you out of position? Are you trying to be someone you’re not or be everything for everybody? That’s a surefire path to frustration, bitterness and wasted potential. And not only will you hurt yourself, but you will also hurt those around you in the process. We're all blessed with unique talents, passions and skill sets that can be used to bless others. We can't enjoy them and use them if we are always complaining about what others have that we don't. Nothing steals joy and generates resentment as much as envy does. The best teams in basketball are made up of players that can fill different and unique roles on the team. Likewise, healthy churches, workplaces and homes are made up of individuals with different skills and personalities working together towards a common goal. In 1 Corinthians 12, Paul states that service and spiritual gifts come in various forms. You have something unique to offer to those who are around you. We all need each other, though. We're much more effective serving God and serving others together instead of going it alone. In verse 17 of that chapter, Paul writes: "If the whole body were an eye, how would you hear? Or if your whole body were an ear, how would you smell anything?" Maybe you can play basketball very well. Maybe you can paint well or sing beautifully. Maybe you have the ability to teach or design bridges. Whatever it is, that's your position. Play it well.